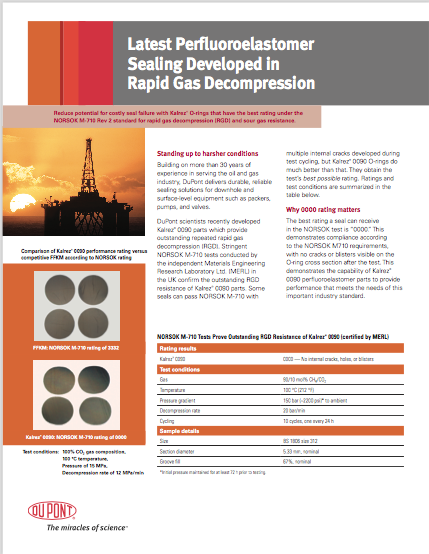 Kalrez® 0090 perfluoroelastomer Orings from DuPont™ are specifically designed for the oil and gas industry to provide outstanding resistance to rapid gas decompression (RGD) and explosive Decompression (ED) as well as high hardness and high modulus properties. Some application areas include downhole equipment such as drilling and completion tools as well as industrial equipment including pumps and valves. Kalrez® 0090 was tested by independent UK-based Materials Engineering Research Laboratory, and passed the NORSOK M-710 Rev 2 standard for rapid gas decompression with the highest possible rating of 0000. O-rings with lower ratings are likely to suffer greater cracking when exposed to pressure cycling. Once a crack is initiated in an o ring, gas will accumulate at the next pressure cycle, eventually leading to a complete crack across the section, which could lead to seal failure. MERL also certified the excellent resistance of Kalrez® parts to sour fluid ageing, including multi-phase fluids containing hydrogen sulfide. 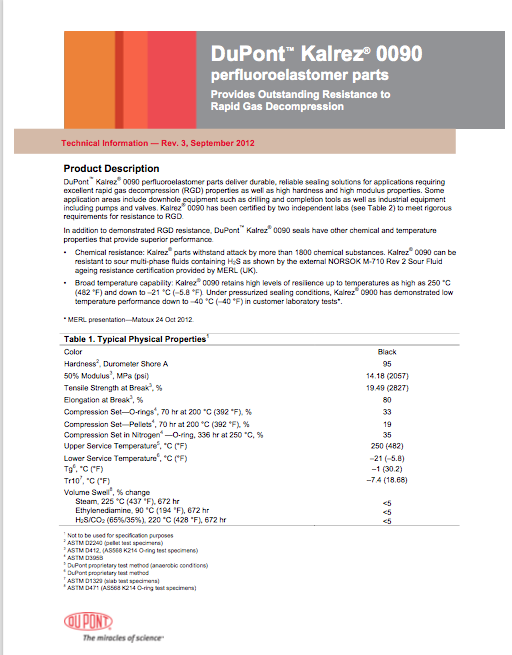 Explosive decompression (ED) performance has also been validated by customers in the US and Europe. best possible rating for RGD resistance. Vespel® CR-6100 parts from DuPont™ perform as back-up rings in a wide range of high-pressure pumps used in hydrocarbon processing and refining. Vespel® CR-6100 parts outperform those made from alternative materials such as polyetheretherketone (PEEK) in several ways. These include higher temperature resistance, more mechanical strength and nearly universal chemical resistance. They are recognized under the latest edition of the ISO 13709 International Standard and the American Petroleum Institute’s API 610 Standard. Vespel® CR-6100 is fast and easy to machine. Kalrez® parts withstand attack by more than 1800 chemical substances. Kalrez® 0090 can be resistant to sour multi-phase fluids containing H2S as shown by the external NORSOK M-710 Rev 2 Sour Fluid ageing resistance certification provided by MERL (UK). Kalrez® 0090 retains high levels of resilience up to temperatures as high as 250 °C (482 °F) and down to –21 °C (–5.8 °F). Under pressurized sealing conditions, Kalrez® 0900 has demonstrated low temperature performance down to –40 °C (–40 °F) in customer laboratory tests*.